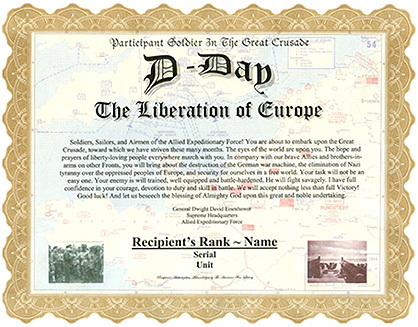 An unaltered photocopy of your DD-214, WD AGO, NAVPERS, NG or other military issued document clearly displaying the veteran's participation in the D-Day Campaign. 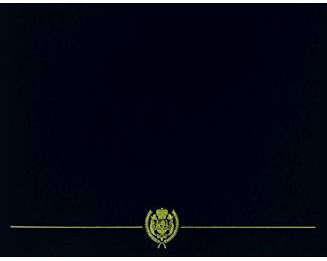 Established on May 11, 1942. The D-Day Participation is awarded to any member of the Armed Forces of the United States who, subsequent to September 8, 1939, shall have distinguished himself by meritorious achievement while participating in aerial flight. It was given for combat or non-combat action, and conferred in recognition of single acts of heroism or merit for operational activities against an armed enemy. Additionally, it is given for meritorious services, or for sustained distinction in the performance of duties involving regular and frequent participation in aerial flight. During the first six months of 1944, the United States and Great Britain concentrated land, naval, and air forces in England to prepare for Operation Overlord, the assault on Hitler's "Fortress Europe." While the Soviet Union tied down a great portion of the enemy's forces, the western Allies marshaled their resources, trained their forces, separately and jointly, for the operation, and fine tuned the invasion plans to take full advantage of their joint and combined capabilities. Before the invasion, the air and sea components played major roles. The 12,000 planes of the Allied air forces swept the Luftwaffe from the skies, photographed enemy defenses, dropped supplies to the resistance, bombed railways, attacked Germany's industries and isolated the battlefield. The Allies' naval component was similarly active during the buildup. The navies escorted convoys, patrolled and protected the English Channel, reconnoitered beaches and beach defenses, conducted amphibious rehearsals and organized and loaded a mighty flotilla to land the assault forces in France. Meanwhile, the nine army divisions (three airborne and six infantry) from the United States, Britain and Canada trained and rehearsed their roles in the carefully choreographed operation. Rangers climbed cliffs, engineers destroyed beach obstacles, quartermasters stockpiled supplies and infantrymen waded through the English surf as each honed the skills necessary for the invasion's success. The invasion itself gave prominence to land forces but provided major roles for air and sea components. Allied air forces carried three airborne divisions into battle, protected the force as it crossed the English Channel, and attacked targets throughout the invasion area before and after the landing in support of the assault forces. More than 5,000 ships--from battleships to landing craft--carried, escorted and landed the assault force along the Normandy coast. Once the force was landed, naval gunfire provided critical support for the soldiers as they fought their way across the beaches. In the invasion's early hours, more than 1,000 transports dropped paratroopers to secure the flanks and beach exits of the assault area. Amphibious craft landed some 130,000 troops on five beaches along 50 miles of Normandy coast between the Cotentin Peninsula and the Orne River while the air forces controlled the skies overhead. In the eastern zone, the British and Canadians landed on GOLD, JUNO and SWORD Beaches. The Americans landed on two beaches in the west--UTAH and OMAHA. As the Allies came ashore, they took the first steps on the final road to victory in Europe.